The crew of Cornwall Air Ambulance has had a busy week, responding to 32 missions across the county. From Monday 19 November until Monday 26 November, the crew flew 19 missions in the air ambulance helicopter and responded to 13 emergencies in the critical care cars. In one instance on Monday 26 November, the charity’s paramedics were called to a female cyclist in Lostwithiel who suffered a head injury. The patient was treated at the scene before being airlifted to Derriford Hospital in Plymouth. On Sunday 25 November, the crew were called in to action when a teenager fell from a horse in the St Austell area. The horse rider received medical care from the crew before being flown to Derriford for further treatment. 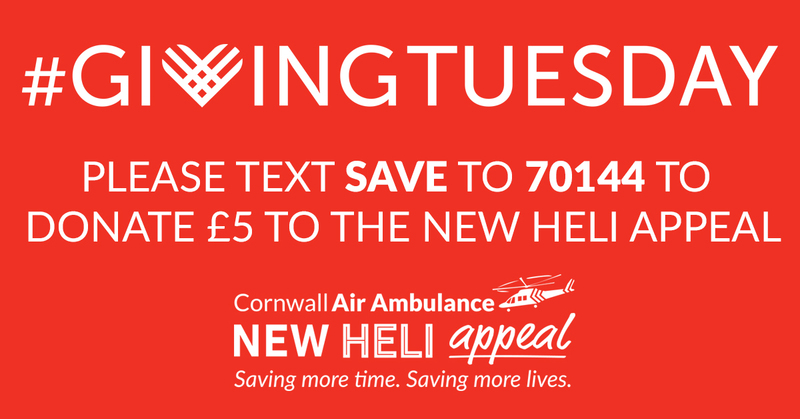 The statistics are revealed as the charity launches an appeal on Giving Tuesday- an international day of supporting charities- to ask for more support to bring a new air ambulance to Cornwall. Donate to the New Heli Appeal online here.